Nearly two-thirds (63%) of U.S. newspapers had at least one woman in their top three editing positions in 2013, according to the new annual census from the American Society of News Editors (ASNE), using 2013 data. Nearly half the papers responding (49%) said that one of those top editors was a woman, 12% employed two women in those top slots and 2% reported that all three top editors were women. While there are no previous ASNE data with which to compare the top female leadership findings, other efforts have tracked women at top levels in different kinds of management jobs. According to the recent Radio Television Digital News Association report on staffing in local television news in 2013, 31% of all the news directors were women while they represent 20% of all local station general managers. A 2013 report from Catalyst, a nonprofit focusing on women in the workplace, found that women accounted for about 15% of executive officer positions in the Fortune 500 companies. Data for 2013 from the U.S. Bureau of Labor Statistics found that among the all industries tracked, women made up 27% of chief executives. 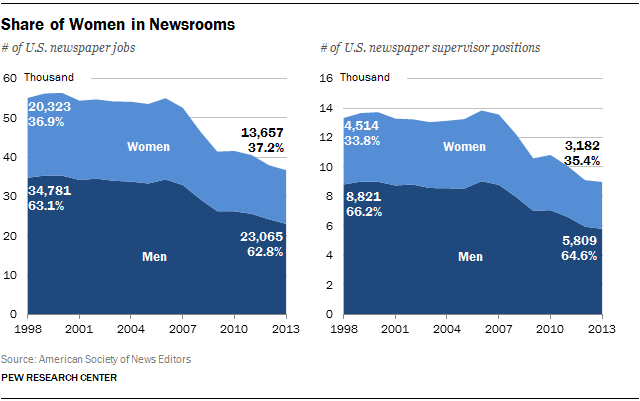 In general, the new ASNE numbers show little change in how many women work in U.S. newspapers and what jobs they hold. Overall, there was a slight increase in the proportion of women in newsrooms—from 36.3% in 2012 to 37.2% in 2013. That number, however, has fluctuated little in the past 15 years—ranging only from 36.3% to 37.7%. The percentage of women supervisors also edged up in 2013 to 35.4% from 34.7% in 2012. But, overall, that number has remained largely stagnant in the past 15 years. The survey results indicate that the job category with the highest percentage of women is copy editing/layout editing/online producing, where women represent 41.6% of the workforce. Conversely, the category in which men are most represented (at 73.2% of the workforce) is photographers, artists and videographers. Issues of pay are not addressed in the ASNE survey, but a recent Indiana University survey of 1,080 U.S. journalists found that the median income for women employed at newspapers in 2012 was about $5,000 less than for men: $42,857 for women compared with $48,037 for men. In other words, women typically earned 87% of what men did.